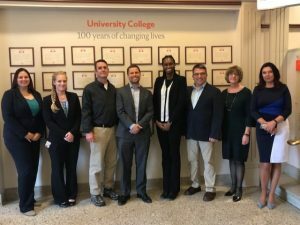 Syracuse University’s English Language Institute (ELI) met with soldiers from the 403rd Civil Affairs Battalion in Syracuse to help them prepare for a yearlong civil affairs mission in East Africa. These civil affairs officers use their expertise, language competency and political-military awareness—along with cross-cultural communication and military skills—to conduct operations throughout the world. Sergeant First Class Michael Malizia, Captain Adrienne Gibson, Specialist Megan Sleeth, Captain Marl Pasibe, and Sergeant Andrew Boyd will host English language discussion groups. “Helping civilians build on the English skills they are already learning will empower them and establish and grow the relationship the U.S. has in this area,” said Gibson. The soldiers observed English language lessons taught by Connie Walters and Patrick McKinnon and met with ELI staff members Danielle Benjamin, Jackie Monsour, Olga Oganesyan, and director David Lind to learn teaching strategies to lead discussion groups in East Africa. “Consider using alternative methods to enhance the oral language instruction,” said Oganesyan. “Journaling and watching films can stimulate critical thinking and give group members another way to express themselves and make instruction interactive. It gives them tools to share stories, talk about their culture, and learn about ours, all while speaking English.” The ELI staff advised the soldiers to be culturally sensitive and establish a safe learning environment where everyone feels comfortable participating. Syracuse University’s English Language Institute at University College serves students of diverse backgrounds who wish to prepare for undergraduate and graduate programs in the U.S., and professionals who wish to advance their careers. The ELI also provides consulting and support services for units that work directly with international students.